Creating better scientific posters was the original impetus for this website. This initial guide helps scientists organize their ideas, visually, on a poster. This includes addressing major questions like, how many columns to have, what size font to use, and even how to pick colors. 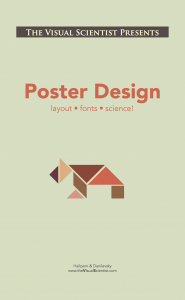 Click to download the Poster Design Guide now.